Ambient sound makes lights dance and/or adjusts its brightness. An improved circuit over that crappy color-organ circuit of the 70’s. This circuit is intended to be powered from 120VAC, and can control 120VAC resistive loads, such as incandescent lamps, up to 4 amps. Just under 500W. Note: The kit only includes the PCB and parts ! Not, the lamp, socket, nor “suicide cord” box, shown in the picture, above !!! Notice, As of June 18, 2016: These are the last 10 Kits, up for sale on eBay ! Once sold out, this kit will no longer be available. Look for my two new color organ kits, for the same function (CO3I & CL3). When the first thysistors (SCRs & TRIACs) were developed back in the 50’s, it became economical to control a considerable amount of AC power at very high efficiency. The thysistor, like its thyratron forbear-er, controlled power levels by chopping up the AC sine wave, time wise. Power was either “on” or “off”, with the ratio of the “on” versus “off” determining how much power was delivered to the load. This method let the controlling device (thyratron or thysistor) stay cool, sort of. The thyratron needed a filament to be powered and heated, since it is a thermionic electron tube. Plus they’re expensive. The semiconductor thysistor, was initially expensive, but the price went down, as over a short time. Also semiconductors have no filaments, and run quite cool. The TRIAC (full wave AC thysistor) quickly became “the device” for low cost motor speed controls. A simple circuit for the TRIAC motor speed control popped up in hobby magazines and project books all over, before the 50’s ended. During the 60’s the TRIAC’s little half-wave cousin, the SCR (silicon controlled rectifier), began to be used in a circuit called the “color organ”. The basics of this circuit, is that audio was fed into the input controlled the brightness of a set of colored lights. Usually, there were at least 3 sets of different colored lights, each with its own SCR. Each had a small filter at the “front end” to allow a certain portion of the audio spectrum thru, hence the name ” color organ”. Each color responded to the low tones, mid tones, or high pitch tones. But the brightness control was “iffy”. It relied on statistics. A small signal would turn-ON the SCR infrequently, so the light output was mostly dim, a loud sound, would trip the SCR more frequently, therefore brighter. Thyratrons and thysistors, once ON, will stay ON, until the current goes away. They are said to be “latching”. With AC they will only stay “latched”, for half a wave maximum. Each sine wave goes to zero twice per complete cycle. At this time a thysistor will turn-OFF. This circuit, is an improvement over the old “color organ”. 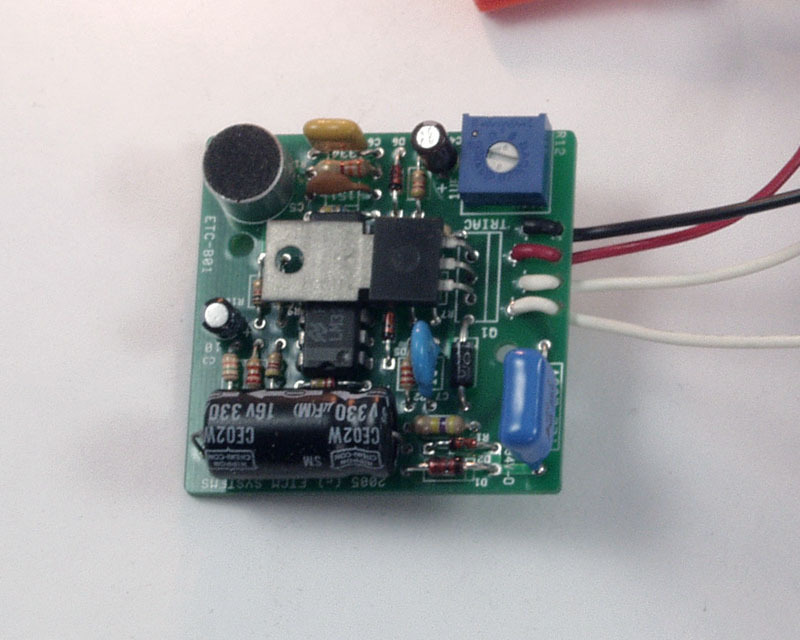 Audio is picked up thru a small electret microphone, which is amplified by one, of the 4, op-amp stages, of an LM324. Using a microphone simplifies things, since no direct connection is made to the audio source. Connecting two different circuits is always a potential for havoc. Lots of Hi-Fi stereos were lost when connected to a non-isolated color organ. In this circuit, the “envelope” of the audio is used to control the loads (usually a set of lights) brightness. Here 2 stages of the LM324, are used create a “reset” pulse (for a very short time) at each “zero crossing” of the AC sine wave. This pulse, coming out U1-14, is used to momentarily charge C7 to ~10V. After that C7 slowly discharges thru R7 & R12, resulting in a negative going ramp. When the “ramp” level fall, to less than the audio (as defined by the envelope) the last stage of the LM324 (U1-7) turns ON the TRIAC (Q1). With this “falling ramp” scheme, the lower the audio, the later the TRIAC is turned-ON. Higher level audio turns -ON the TRIAC earlier. This ramp is repeated every half of the AC wave, and is synchronize with its “zero-crossings” The result is that low level audio has the TRIAC “on” for a short duration, and high audio levels has the TRIAC “on” for a much longer duration. By setting R12, the ramp rate is adjusted, and should be set in a low noise environment. Set it for your desired minimum lamp brightness. Note: using this scheme allows much, much, better control of the brightness, than the old “color organ” statistical crap shoot. You can’t dim the older type circuit due to its very nature. Try it. Prove me wrong ! Also, you can adjust this circuits response time. If you want it to behave to the audio, like the old “color organ”, make the RC time constant, of R13 and C4, fast. Its currently 47K and 1uf, for 47mS, which is as about as fast as you want it. If, however, you want the light to average out the ambient noise, then slow down this RC pair, by either making R13 or C4 larger, or both. C1, limits the current powering the control circuit. D1 keeps it under 12V. C1 can be as low as 0.22uf, but an 0.47uf device, will give you more margin. Old TRIACs needed as much as 50mA to trigger. That’s why SCRs where used in older circuits since they needed less than 1mA. In the 80s, “logic TRIACs” came into being. These need 5mA or less, in the most important quadrants (I & IV). Always look for 4-quadrant logic TRIACs, to be used with this circuit. Side note: Circuits like this that control power in this fashion, include motor speed controls and lamp dimmers. They are said to be “leading edge” dimmers. Not because they’re new. They are not. Its because they control brightness, by delaying the turn-ON, of the “leading edge” of the wave powering the load. Note this when buying new LED bulbs intended to replace 120VAC incandescents. Some specify “leading edge” dimmers. Don’t buy a new dimmer. The ones you already have, are “leading edge” dimmers. Photo of finished board (Click on photo to enlarge). The frequencies don’t look like they overlap. In reality, they do. Those numbers shown, are the “3dB” (or half-power) cut-off points. Plenty of signal on either side. If an exceptionally large bass note hits, it will still trigger the treble set unit. Buy 3. One for each range, to make a real color organ ! 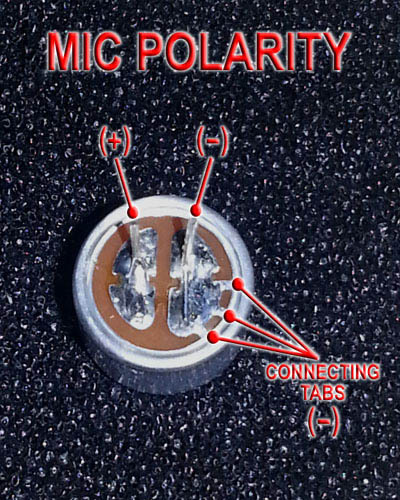 Assembly note: If you insert a polarized cap, into the C6 location, the positive (+) lead goes into the hole right next to the “C6” silkscreen label. Now available a complete 3-channel color organ, on one board. Notice, August 9, 2015: In addition to the Mood Lite kits currently listed, I have ~10 bare boards in my inventory. Those will be the last boards to be “kitted”. Once all these kits are sold, the Mood Lite kit will be discontinued, in favor of the 3-Channel Color Organ Kit.